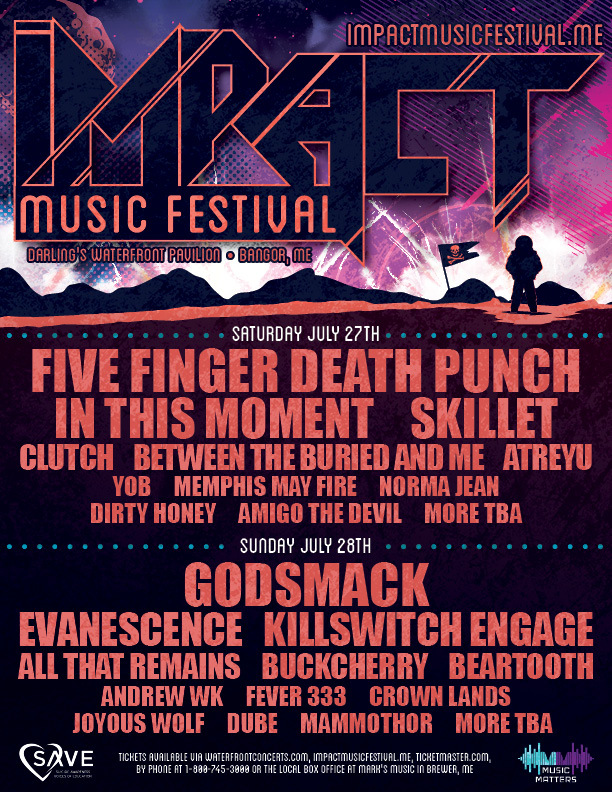 The 2nd annual Impact Music Festival hits Darling’s Waterfront Pavilion on July 27th & 28th with headliners Five Finger Death Punch, Godsmack, Evanescence, In This Moment, Skillet, and Killswitch Engage. Other acts include Clutch, Between The Buried and Me, Atreyu, All That Remains, Buckcherry, Beartooth, YOB, Memphis May Fire, Norma Jean, Andrew W.K., Fever 333, Crown Lands, Dirty Honey, Amigo The Devil, Joyous Wolf, Dube, Mammothor, & more TBA. WHSN will give away tickets Monday through Friday, February 4th, 2019 through February 8th, 2019 with the Brace For Impact giveaway. Each day listen during the Noon hour for a song by an Impact Music Festival artist and be the first caller at 207-941-7116 to win a pair of festival passes (2 tickets to both days of the festival) courtesy of Waterfront Concerts.